THE SPOT OF MTBO 2011 IS ONLINE. The spot of the mountain bike orienteering world championships was recorded some days ago and will be on air soon on national and local radios and televisions. The spot is available in two versions (Italian and English) in the home page www.mtbo2011.org (just clik in the banner above), featuring the voice of Stefano Ceiner (speaker at Torino 2006 Olympic Games) and the song "Follow the Sun" by Nicola Manfredi, official anthem of MTBO 2011. SAPA PARTNER OF THE WORLD CHAMPIONSHIPS. 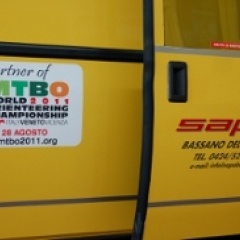 The message of MTBO 2001 ("More value to the area") is on a trip in the Veneto routes thanks to Sapa Autoservizi, located in Bassano and partner of the world championships. The slogan was chosen by the organizing committee to promote the Vicenza area through sport.